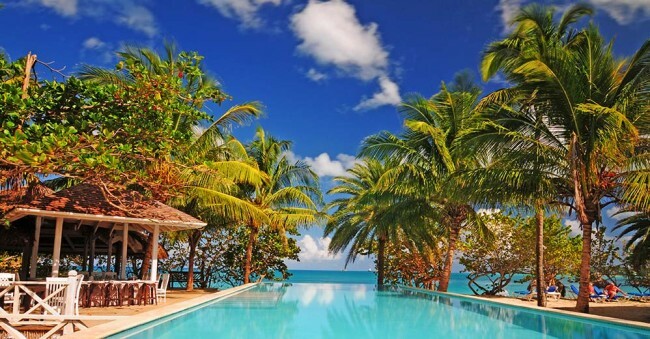 Top 5 Islands in the Caribbean Sea with Wi-Fi – Trade While on Vacation! It’s vacation time for all you trading sharks out there! I was doing my routine “time to dream myself away searches” on the net and stumbled upon Islands.com that got me interested in Island vacations! I thought, why not? Nowadays there’s Wi-Fi everywhere so if you are a pro trader and can afford a nice vacation you can keep trading while enjoying the nice view in front of the beach. I have looked through some of the top Caribbean Islands suitable for vacation where the hotels provide Wi-Fi so I can still trade. Following is my top 5 list of Islands in the Caribbean Sea; all the prices I mention are meant for two adults but you can check out the links down below and customize your own accommodations based on your budget. If you already have your bags packed and are ready to go make sure you bring your smartphone or laptop so you can keep trading! The first in my list is St. Thomas, Virgin Islands. This secluded spot is close to Puerto Rico; the water is clear and blue and the land is green and sunny. Many tall ships come and go through the bay, bringing hundreds of tourists seeking relaxation and fun. Reports say that the native people are very friendly and welcoming, but if you prefer a little more privacy you can book a nice cottage on the hillside for only a couple hundred bucks per night. The view from up there is fantastic and you can even trade while enjoying the view, wifi is available in most rentals and hotels. After the market close, when it gets cooler at night, you can ride the telecabine down to the coast for some Sushi or a coconut cream drink. Okay, I thought my next pick should be a little bit more… budget friendly. Not all sharks can afford the ultra rich digs available on St. Thomas. This Island is also located just north of Venezuela’s coast and is one of the ancient pirate havens. The beaches are white with sand and there are plenty of Golf courses for all of you “Tiger Wood’s” out there. In case you like to gamble there is a casino too! The hotels are nice, for around $150 per night you will enjoy many amenities like, AC, pool, laundry service, gym and Wi-Fi so you can trade! There are a variety of water sports if you are looking for an adrenaline kick but if you are the calm type, there are hundreds of shaded picnic areas and trails for hiking too. The most unique experience is during the turtle hatching season when you can watch four species of sea turtles hatching on the beach and fighting their way towards the ocean! Here is another great Island with Wi-Fi, Puerto Rico’s Ocean Park. You’ll find crystal clear water and palm trees near sandy beaches, international cities and exciting night life. If you like snorkeling, zip lining and kayaking they’ve got everything you need in its unique national rain forest. Go there for a long hike, climb towers and enjoy the amazing view before returning to town for an evening of overindulgence. My choice for lodgings is a stay at the penthouse apartments, they provide an ocean view that are fairly cheap and the Wi-Fi is free. This Island is also located near Puerto Rico so you can take a cruise ship to the big city after exploring Oualie Bay. There are incredible areas nearby in St Kitts if you like diving and on the main land you will find museums and the Notre Dame which is an old church dating back to the colonial days of the 18th century. If you dare to visit the dormant volcano Liamuiga the trip will only take an afternoon. You can get there by foot, if you like hiking this is an adventure you don’t want to miss. Maybe you just want to relax, and trade, that’s OK to. The music festival and the islands many local restaurants might be just for you! On Antigua you can relax in your Wi-Fi included ocean view suite with a beach closeby where the sun is shining above the coconut trees, well in range of the internet connection. Visit many bars and museums, try different water sports and enjoy local culture. I suggest you try the Coconut Grove Restaurant which is located right on the beach just a few feet away from the water. They are a perennial favorite and they know how to please both vegetarians and carnivores. You should also try the unique experience of swimming with the stingrays! Just visit a diving center and let them take you on this adventure, all paid for with money you make while trading from your ocean side cabana! No matter which Island you pick, just make sure to book a room with Wi-Fi included so you can keep trading on your smartphone or laptop. If you pick a really great place you can even get wi-fi throughout the resort or hotel that extends out to the beach itself! My advice, don’t overdo it with the trading, after all you will be on a vacation so only trade when there is an opportunity… just to make some extra cash for the shopping! Your smartphone is a good camera as well so don’t forget to take pictures too. Then you can let us know how your vacation was and how it was to trade while dipping your feet in your private pool. http://www.Islands.com Best Islands to visit or live on.